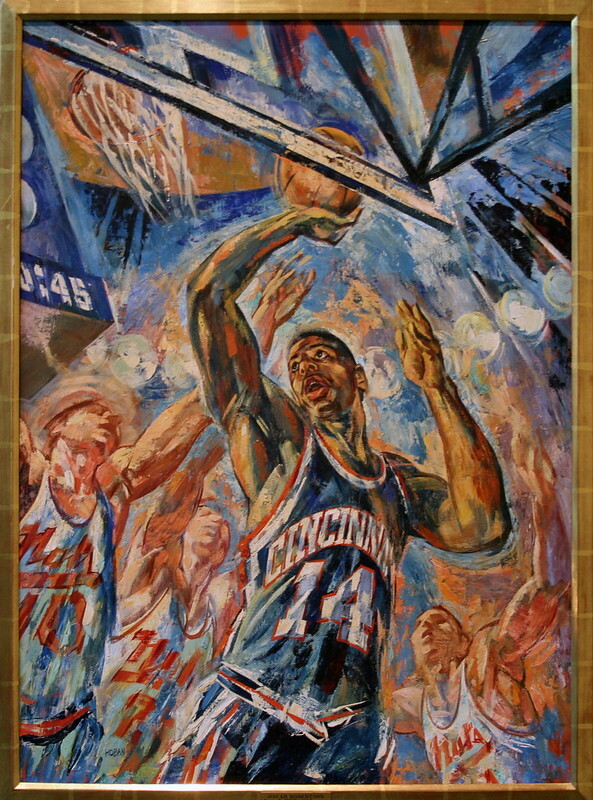 Oscar Palmer Robertson, born 24 Nov 1938, by Russell Hoban, Casein on Masonite, 1961: Few players in basketball history have rivaled the talent and versatility of the NBA All-Star known to fans as "The Big O." Averaging upwards of twenty-five points per game during fourteen stellar seasons with the Cincinnati Royals (1960-70) and the Milwaukee Bucks (1970-74), Oscar Robertson amassed a career record of 26,710 points to become the top-scoring guard of all time. His superb playmaking and rebounding skills coupled with his phenomenal ability to sink baskets from virtually anywhere on the court, made him both a defensive weapon and an offensive threat. Although some of his achievements have since been equaled or exceeded, Robertson continues to hold one of the most remarkable records in all of pro basketball, for he is the only player ever to have double digit averages in scoring, rebounding, and assists-a "triple-double"-throughout an entire season. Image published by cliff1066™ on 2008-09-20 15:27:39 and used under Creative Commons license.